In a school district of Zhengzhou, Central China's Henan Province, several elementary students were seen standing around holding 10 yuan ($1.59) or 20 yuan banknotes. One boy foisted the cash into a passing girl's hands, but she refused it. "Sorry, I already got 20 yuan from Hao, so I can't vote for anyone else." "Hao gave us 20-yuan. But look at him, 10-yuan is so stingy, he will never be the winner," another boy explained to a journalist from local Henan Business Daily. After talking to a few students, the journalist found out from them that "campus vote buying" is "very prevalent in the school." Those who wish to get the position sometimes gift their classmates cookies or fruits, or even their own pocket money, though other students are rejecting the practice of vote-buying. "I will never participate in the class election anymore because it's so boring and unfair," Pengpeng, a student at the above-mentioned school, told local media. "Our classroom election is too dark and corrupt. The crown will always be granted to those whose parents are wealthy or working for and investing in the school, no matter how disappointing their academic record." As an unhealthy understanding of authority and power sweep into Chinese campuses, many parents are concerned that their children are becoming corroded by corruption at such an early age. Middle-class families in particular have been fueling this campus corruption by buying their children leadership positions rather than participating in a fair election based on their personal capability. Some say such parents fail to support "the right sense of competition" and others attribute the behavior as an inheritance of society's corruption culture. At the end of 2017, Chinese social media was flooded with news that a class monitor at a primary school in Huaiyuan county, Anhui Province, had received bribes worth 20,000 yuan from his classmates. Xiao Ci, a deputy monitor and course representative in his class, was assigned with the responsibility of checking his classmate's homework and supervising their recitation assignments. But the 13-year-old reportedly "took every advantage of his rights" and accepted 20,000 yuan in bribes over the course of five years from six peers. While many people have gotten used to the news of government officials getting caught in China's sweeping anti-corruption campaign, it is beyond their imagination that the younger generations have inherited such a practice. Xiao Ci's corruption started by extorting those who failed to pass their exams with a promise of saving them from their teacher's punishment as long as they paid him hush money. He finally became the only decision-maker to decide who could pass the examination. "If this happened in the adult world, is this a 'big tiger' worth noting? It seems that the clean-up and anti-corruption campaign should start with our kids," netizens expressed on Chinese social media Sina Weibo. Others felt surprised that officialdom has permeated the world of children. "Though the case is a bit extreme, it is true that the dirty practices of the adult world are being projected onto primary school campuses," read one comment. Chinese film director Chen Weijun produced a documentary, Please Vote for Me, back in 2007 to tell the stories of third-grade student's first democratic election at a local primary school. During the process, vote-buying, lip-service and slander were seen at schools, with some parents getting involved. In the film, the election was finally won by the son of a local police chief - after his parents took everyone on a field trip and presented them with gifts. The film won several international film festival awards, but was not released in the China mainland. 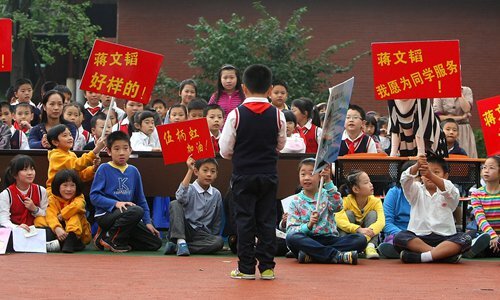 A fifth-grade teenager told the Global Times about the abuse of power occurring among her class cadres. Xiao Kun said that she was put on a "list of breaking the sanitary rules" partly because she did not develop a good relationship with the student in charge of hygiene inspection. She also saw other students buying the class leader ice cream. "It's all about personal relationships," Xiao Kun concluded. Children's enthusiasm to get involved in class leadership has made others ask: do they really love to serve their peers, or do they just want power and privileges? A reporter from the Southern Metropolis Daily once interviewed 32 primary-school kids, with 80 percent of them saying they wanted to be class cadres, as being leaders can earn the attention of their teacher, respect from their peers, and bigger chance of winning merit awards from the district or city government. A teacher surnamed Zhu from a top primary school in Taiyuan, capital of North China's Shanxi Province, told the Global Times that being a class cadre is a way of being awarded commendation, which increases their chance of accessing a better middle school. 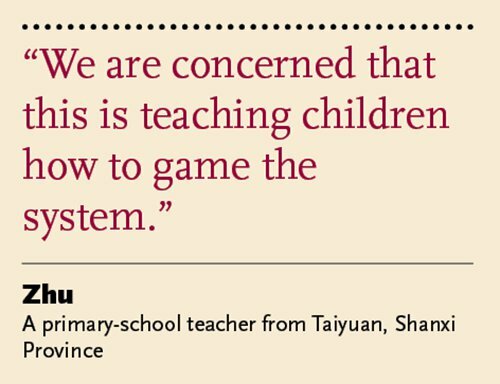 "We are concerned that this is teaching children how to game the system," said Zhu. Wang Guoqi, the vice president of Shaanxi Family Education Research Association and director of the Social Science Institute of Xi'an, explained children's enthusiasm for class leadership from the perspective of China's worship of bureaucracy in some conservative regions. "It is absolutely no accident to see kids canvassing for votes using improper means, because it reflects malpractices that exist in real life," said Wang. "Chinese people historically regard one's academic achievements as a springboard for a prosperous official career. Especially for many working class families, children who are promoted to the management level are highly praised by parents," said Wang. "Therefore, it is not surprising to hear that primary students are competing for leadership positions using a variety of dark means." Interviewing some of Zhu's 6-grade students, most suggested that good qualifications and popularity are core standards in choosing class leaders. But a few defended their suspected corrupt behavior, claiming that "it's not so different when you adults buy your supervisors dinner to stay in an official post," as quoted by one 13-year-old student. "Such exposure to malpractice is surely dangerous for the whole society and for the future of the nation, as children may lose their respect for rules and laws. They will expect to amass a personal fortune through unethical means," said Zhu. "We should teach children that abusing their positions of power for profit is wrong," Xiao Kun's mother told the Global Times. Working together to stop corruption in primary schools, educators are weakening children's sense of power by emphasizing service awareness. Moreover, they continue to support the fight by reviewing their class cadres-election system set by individual schools. Zhu believes that combining a student's democratic vote and a teacher's "gatekeeper" role is the most reasonable way to stop children from abusing their voting rights. Alternatively, her colleague, Fan, is inclined to return the rights absolutely to her students without any additional intervention from teachers. Fan plans to set up a one-month "probationary period" for elected candidates. She regards a well-designed whistle-blowing mechanism as a valuable way to inform students about a healthy democratic system while imposing sanctions for corrupt behavior.